"Creating a common thought-form" From a circle of thought-creators emerges one piloting a paper plane. The team creates a broad perspective of possibilities for few or even only one to use. The winged horse is a symbol for speed, no boundaries and directional thought. Below, from among all mental possibilities, represented by all colors, consent is reached. Sun/Mercury: Common thoughts, consent Theme for contemplation: Group-meditation Affirmation: "I am myself and I am everybody else too" Hint: Try a group-meditation before discussing a project in a group. Tell a strong joke right after the meditation. The results will surprise you! "One size doesn't fit all" In the material world certain symbols are restricted to very specific meanings. 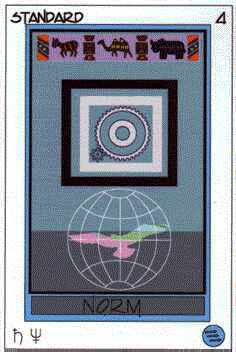 Although the free flying bird of art and intuition is somewhat caged by world-wide standards and conventions, these are often necessary for elementary communications and technical purposes. Saturn/Neptune: Conventional imagination. Theme for contemplation: Where is limitation helpful, where is restriction rightful? Affirmation: I am what I prefer to be, not what you expect me to be" Hint: On your path to find yourself clear borders are often helpful. Only rebels find their very own way. "It's your neck that saves itself" (W.W.II pilot saying) The Chameleon, representing utmost adaptability and flexibility, has, of course, taken on the background color. 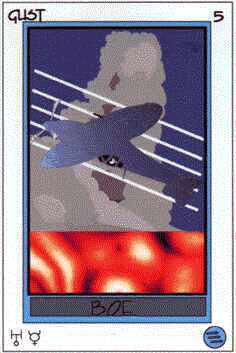 Weather, one of the most unpredictable elements of earthly existence, often requires extreme flexibility, even more so in flight, when the life of the pilot depends on flexible reactions and, as a fighter pilot, evading enemy fire often depends on a flexible neck to assess all sides of the situation quickly and for "faster than conscious thought" type reactions. Below, new, not yet materialized events are forming, ready to bubble up and change our reality -or maybe just the perception thereof. Uranus/Mercury: Spontaneity, flexibility. Theme for contemplation: Spontaneity, vitality, flexibility, impulse and intuition. 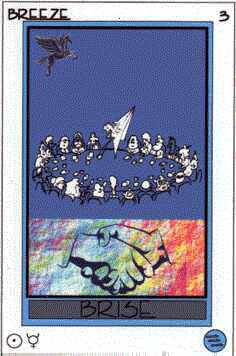 Affirmation: "I am read" Hint: Do the unexpected in a otherwise predictable situation. Open doors with your left hand, smile where you would otherwise look neutral.